This bone broth recipe for a slow cooker or crockpot is an easy way to get the healing properties and nutrition of bone broth without much hassle. I love bone broth and credit it for helping me heal from my leaky gut. Traditional bone broth is one of the most healing and nutrient dense substances that we can add to our daily lives, as well as for treating specific illnesses. It can help restore health and work towards healing of autoimmune issues. For centuries it has been a healing food in cultures around the world. But what makes a broth from bones so special? Well, the complete nutrient profile of bone broth varies on the type of bones used, as well as how and what it is cooked with. However, it is undeniably rich in minerals that are found in bones and marrow, including calcium, magnesium, iron, silicon, phosphorus, sulphur and other trace minerals. 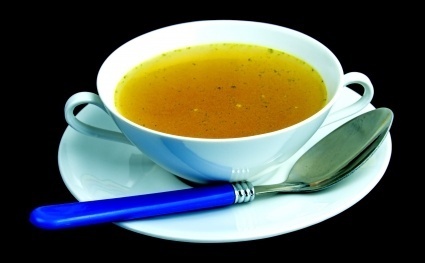 Bone broth also contains easily digestible proteins such as gelatin, and other unique substances that are difficult to obtain in other foods, such as marrow, cartilage, glycerin, proline, and collagen. Thankfully bone broth is simple to make, in fact, it’s probably the most nutritious concoction that requires the littlest amount of work. 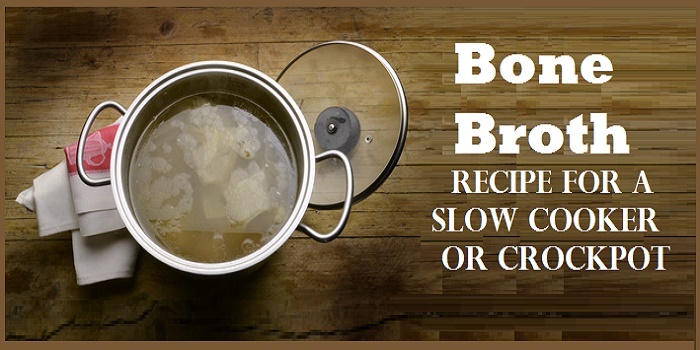 If you have access to a slow cooker you can easily get this started. • 2-3 pounds of bones (If using beef bones, you may want to roast them first for added flavor.) Use the best quality bones you can find. • garlic, salt and pepper if desired. 2. Cook on low setting for at least 12 hours and as long as 24 hours. The longer you cook it, the more nutritious your broth becomes. 3. Remove from heat and let cool a bit before running through a strainer to remove bits of bone, skin/meat, and vegetable particles. 4. Once cooled, it should gel a bit. That is good because that means that it got a good amount of healing gelatin from the bones! Do not remove that!!! You can refrigerate for up to 7 days or freeze to use at a later date. Now that you’ve made your own healthy elixir you can drink a small cup daily for an immunity boost or to heal from leaky gut. You can also use it as a base or soups or to enhance the flavor of your cooking. Because it is one of the easiest foods to digest, it takes little energy from the body and is incredibly nourishing to the digestive tract and helps to treat many chronic illnesses. The high gelatin content is considered one of the most healing foods for your health. Another use of bone broth is as a blood builder. Bone marrow is where the body creates blood cells, and the process of cooking down bone marrow supplies everything you need to build those new red and white blood cells. Gelatin in particular helps to regenerate red blood cells and is often used to treat anemia. Bet you didn’t know gelatin could be so useful! This is really only scratching the surface of the benefits of this immensely nourishing and versatile broth. Because this broth can help with common issues such as stress, immunity and fatigue, it makes a great staple to have on hand!